The city's site was first settled in the 1870s as Okabena Station on a line of the Chicago, St. Paul, Minneapolis and Omaha Railway, later the Chicago and North Western Railway (now part of the Union Pacific Railroad) where steam engines would take on water from adjacent Lake Okabena. More people entered along with one A.P. Miller of Toledo, Ohio, under a firm called the National Colony Organization. Miller named the new city after his wife's maiden name. The town of Worthington was founded by "Yankees" (immigrants from New England and upstate New York who were descended from the English Puritans who settled New England in the 1600s. In spite of tensions between pro-temperance and anti-temperance factions, the town grew rapidly. By the end of summer in 1872, eighty-five buildings had been constructed where just one year before there had been nothing but a field of prairie grass. On December 12, 2006 the Immigration and Customs Enforcement (I.C.E) staged a coordinated predawn raid at the Swift & Company meat packing plant in Worthington and at five other Swift plants in western states, interviewing workers and hauling hundreds off in buses. According to the United States Census Bureau, the city has a total area of 8.74 square miles (22.64 km2), of which 7.34 square miles (19.01 km2) is land and 1.40 square miles (3.63 km2) is water. The U.S. Bureau of Census now classifies Worthington as one of its micropolitan areas. Population of the Worthington Micropolitan Area is 20,508. As of the census of 2000, there were 11,283 people, 4,311 households, and 2,828 families residing in the city. The population density was 1,578.9 people per square mile (609.3/km²). There were 4,573 housing units at an average density of 639.9 per square mile (246.9/km²). The racial makeup of the city was 76.81% White, 1.91% African American, 0.49% Native American, 7.06% Asian, 0.13% Pacific Islander, 11.49% from other races, and 2.11% from two or more races. Hispanic or Latino of any race were 19.28% of the population. There were 4,311 households out of which 30.5% had children under the age of 18 living with them, 52.4% were married couples living together, 8.9% had a female householder with no husband present, and 34.4% were non-families. 28.9% of all households were made up of individuals and 15.5% had someone living alone who was 65 years of age or older. The average household size was 2.55 and the average family size was 3.12. In the city the population was spread out with 25.5% under the age of 18, 9.7% from 18 to 24, 27.1% from 25 to 44, 20.1% from 45 to 64, and 17.6% who were 65 years of age or older. The median age was 36 years. For every 100 females there were 98.6 males. For every 100 females age 18 and over, there were 97.6 males. The median income for a household in the city was $36,250, and the median income for a family was $44,643. Males had a median income of $28,750 versus $20,880 for females. The per capita income for the city was $18,078. About 9.1% of families and 13.3% of the population were below the poverty line, including 18.4% of those under age 18 and 12.3% of those age 65 or over. 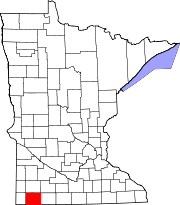 Worthington is located in Minnesota's 1st congressional district, represented by Mankato educator Tim Walz, a Democrat. At the state level, Worthington is located in Senate District 22, represented by Republican Doug Magnus, and in House District 22B, represented by Republican Rod Hamilton. The mayor of Worthington is Al Oberloh. City council members are Lyle TenHaken, Michael Kuhle, Scott Nelson, Ronald Wood, and Mike Woll. There is a sister-city relationship between Worthington and Crailsheim, Germany founded in 1947 and therefore is considered to be the oldest relationship between an American and a German city that has survived post-World War II. Worthington is served by Independent School District 518. George Dayton, a banker and real estate developer in Worthington before moving to Minneapolis to start Dayton's Department Store (now part of Macy's). Recently restored, the 1890 Dayton House is a community historic site and bed and breakfast. Matt Entenza, former minority leader of the Minnesota House of Representatives (2002–2006) and a 2010 DFL candidate for governor of Minnesota. He grew up in Worthington and attended Worthington public schools. Stephen Miller, fourth governor of Minnesota from 1864–1866, later settled in Worthington, representing the area in the Minnesota House of Representatives from 1873-1874. He was an 1876 presidential elector. Upon his death in 1881, he was buried in Worthington Cemetery. Lee Nystrom, NFL player, was born in Worthington. Tim O'Brien, an American novelist known for his Vietnam War literature, grew up in Worthington in the 1950s. He references Worthington in several of his novels, including driving around Lake Okabena in The Things They Carried, published in 1990. John Olson, longtime state senator and Worthington native, represented southwestern Minnesota from 1959–1977. He chaired the Minnesota Senate's General Legislation Committee from 1967–1971, and the Higher Education Committee from 1971-1973. ^ a b "US Gazetteer files 2010". United States Census Bureau. http://www.census.gov/geo/www/gazetteer/files/Gaz_places_national.txt. Retrieved 2012-11-13. ^ a b "American FactFinder". United States Census Bureau. http://factfinder2.census.gov/faces/nav/jsf/pages/index.xhtml. Retrieved 2012-11-13. ^ "Population Estimates". United States Census Bureau. http://www.census.gov/popest/data/cities/totals/2012/SUB-EST2012.html. Retrieved 2013-05-28. ^ "2010 Census Redistricting Data (Public Law 94-171) Summary File". American FactFinder. United States Census Bureau. http://factfinder2.census.gov/faces/tableservices/jsf/pages/productview.xhtml?pid=DEC_10_PL_GCTPL2.ST13&prodType=table. Retrieved 27 April 2011. ^ Worthington album : A project of the Worthington Daily Globe by Crippen, Raymond. Heritage House Publishers, 1998. This page uses content from the English language Wikipedia. The original content was at Worthington, Minnesota. The list of authors can be seen in the page history. As with this Familypedia wiki, the content of Wikipedia is available under the Creative Commons License.